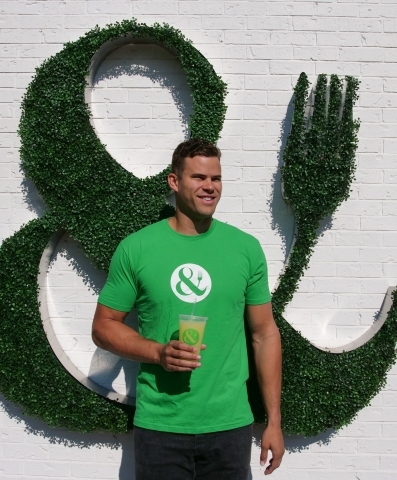 MINNEAPOLIS--(BUSINESS WIRE)--Minnesota-based fast casual concept CRISP & GREEN today announced that a team led by Minneapolis native and former NBA athlete, Kris Humphries, will be the company’s first franchise partner. The former Minnesota Golden Gopher will open his initial location in Dinkytown, with plans to open five additional area locations in the coming months. Kris Humphries and team are veterans in the franchise industry and currently manage a successful fast casual burger empire across multiple states. As an athlete, Humphries was inspired by the robust and healthy options that CRISP & GREEN provides, and after being a regular customer for over a year, decided now was the right time to invest. Construction is already underway at the Dinkytown location, which will occupy the former Espresso Royale space. This location is particularly special to the franchisee, who starred on the Golden Gophers Men’s Basketball team. His father and business partner, William, was also a standout player on the University of Minnesota Football team. “I am proud to share my CRISP & GREEN brand with Kris and his team. He is the embodiment of health & wellness and the perfect ambassador to partner with our team to bring more healthy eating options to Minnesota,” said Chief Executive Officer Steele Smiley. CRISP & GREEN currently has locations in Wayzata and the North Loop. In addition to the Humphries-acquired location in Dinkytown, which is set to open in fall of 2018, a corporate-owned Edina location is slated to open later this summer. For more information on CRISP & GREEN and its franchise program, please visit https://crispandgreen.com/franchise/. CRISP & GREEN is a wellness-driven restaurant chain featuring a selection of signature and seasonal salads, grain bowls, soups and smoothies, all made in-house from scratch with premium ingredients. The restaurant also offers free community fitness and wellness events to promote a healthy lifestyle beyond the kitchen. CRISP & GREEN recently announced an expansion strategy through a franchise program in tandem to the development of more corporate locations. The company is accepting franchise applications at crispandgreen.com/franchise.